Crime Watch: Tick, tick, tick... Bouchercon! Well, it's almost upon us. This week the 2010 edition of the fantastic (I've heard) Bouchercon crime writing festival will kick off. From a look at the lineup and the building excitement on blogs and elsewhere amongst the crime fiction community, Bouchercon by the Bay is going to be absolutely huge. I've got to say, I'm pretty envious of everyone heading along. Scratch that, really envious. Incredible Hulk green with envy. I was quite tempted to hop on a plane from New Zealand, especially as San Francisco, the location of this year's 'Con is one of my favourite US cities, and also a fairly accessible/affordable flight from New Zealand (one of the most geographically isolated countries in the world, apparently). Unfortunately finances and timing hampered my Bouchercon 2010 dreams. But maybe next time. For all of you heading along this year, I hope you have a magnificent time. For those, like me, who can only look on, our faces pressed up against a faraway window, hopefully there will be all sorts of fantastic articles and blog posts coming out about the events, from those lucky enought to be on the ground there in San Francisco. I'm talking to you Peter Rozovsky (Detectives Beyond Borders), Jon and Ruth Jordan (Crimespree magazine), Janet Rudolph (Mystery Readers International), J. Kingston Pierce (The Rap Sheet), and others... make sure you share it all with us. Lee Child, who I was fortunate enough to interview and meet in New Zealand earlier this year (read NZLawyer feature, read 9mm interview) is 'Distinguished Contribution to the Genre' in 2010, and Scottish author Denise Mina, who's Gold Dagger-shortlisted novel STILL MIDNIGHT I recently read, is the International Guest of Honour, at Bouchercon by the Bay. Skimming the programme, there are so many cool events on offer. I'd certainly have some pretty full days there. Watching the San Francisco-set crime movies The Maltese Falcon, Bullitt, and Murder by Death on Wednesday night (6pm onwards) would be a great start to what is going to be a really terrific few days. In amongst all the authors events, there is also the announcement/presentation of several prestigious crime/mystery writing awards, ie the Macavitys, the Barrys, and the Anthonys. And the Dashiell Hammett-inspired walking tours also sound great - San Francisco is such a great strolling city. I hope that everyone heading to the festival has a truly terrific time, and I look forward to reading about all the festivities. 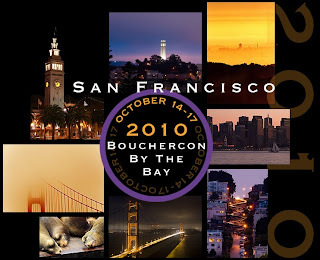 What do you think about the Bouchercon by the Bay lineup? Are you heading along? What events/authors would you most like to attend, if you were going? Who should win some of the awards? Do you enjoy author events and mystery writing festivals? Thoughts and comments welcome. I generally panelize all day, socialize all evening, and blog and sleep or sleep and blog all night, so I should put up a post or two. Good to hear. No slacking Rozovsky!